This is another one that has been in my cupboard for years. I mean, at least 4 and probably longer. I’ve seen recipes that use it but they either call for fresh or frozen yuba and I rarely see dried, though I’m sure they exist. The one I decided to use was another from Herbivoracious. 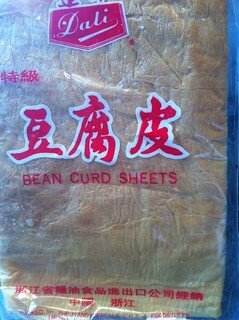 It’s in the breakfast chapter and it’s used in the congee recipe. I have made congee before, and eaten it quite a lot on holiday and I know I love it, so I thought it would be a great way to try the yuba. I made the full amount and ate it for breakfast and have enough for another couple of days, which is great. 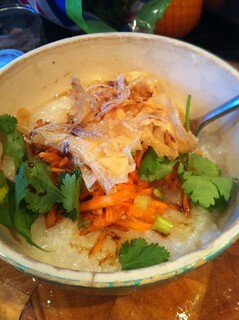 This congee was really good. The yuba was very interesting – you soak it very briefly in hot water, then dry it and fry it. It added a good texture to the otherwise silky congee – if I was pushed I might say it was a bit like the crispy bits on fried egg whites. I also used the leftover preserved vegetables in the congee instead of the extra salt, and used shredded carrot in vinegar as one of my toppings instead of red cabbage. It was a great breakfast and I’m really looking forward to the leftovers. Have you used dried yuba? What did you do with it? This one worked backwards. I was looking through Herbivoracious and thought that the sichuan dry-fried green beans and tofu looked delicious, but that I’d never be able to find the key ingredient, the sichuan preserved vegetable. I put the recipe on the back burner of my mind until I could visit a chinese supermarket. Then several weeks later when I was emptying the cupboard for my stash of unused MoFo ingredients, I found this little packet at the back. I must have bought it the last time Klair and I visited a chinese supermarket together and that must have been easily 4 years ago! I halved the sugar in this recipe for our tastes but kept everything else as it was. My husband said the house smelt like a chinese restaurant when he came in, and he was right. It was amazing. I don’t think I would have been able to identify the sichuan vegetable but I definitely knew there was something different there which gave it a different flavour and made it taste authentic. 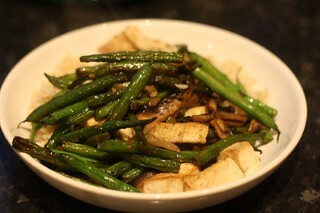 I served it with some simple plain cooked rice which worked well with the salty umami flavours in the dish. 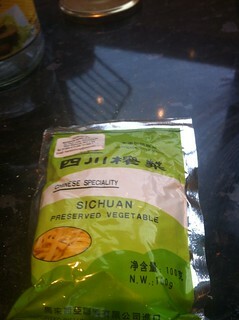 Have you used sichuan preserved vegetable? What did you do with it?